Photo: Edgar Matchett House, ca. 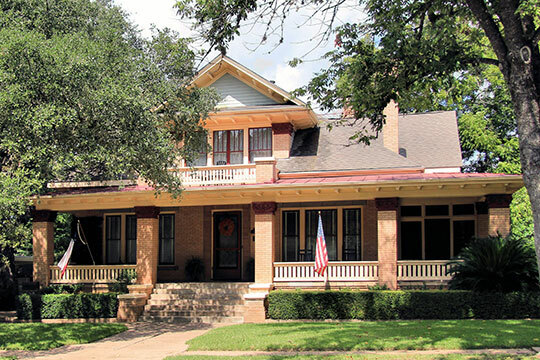 1916, 502 West Main Street, Brenham, TX. Listed on the National Register of Historic Places in 1990. Photographed by User:Larry D. Moore (own work), 2013, [cc-by-3.0 (creativecommons.org/licenses/by/3.0)], via Wikimedia Commons, accessed August, 2014. The Washington County Courthouse is located at 100 East Main Street, Brenham, TX 77833; phone: 979-277-6200. The recorded history of Washington County, including the eight counties originally comprising it, dates back to the beginning of the sixteenth century when Spanish explorers traversed the land and laid claim to it. The territory as a whole, however, was under the purview of various Indian tribes up to the early decades of the nineteenth century when it was settled by Anglo-Americans. Through the persistent efforts of colonist Moses Austin, Spanish officials in 1820 granted permission for three hundred Anglo-American settlers under Austin's leadership to establish a colony in the province of Texas. The untimely death of Moses Austin in 1821, however, left the responsibility of carrying out the colonization effort to his son, Stephen. The younger Austin traveled to San Antonio in 1821 to secure the grant and found on his return that settlement along the Brazos River south of Camino del Real already was underway. Stephen F. Austin further explored this area between the Colorado and Brazos Rivers and chose the section on the west bank of the Brazos down to the coast as the location for his first colony. Included in this territory was the area which later became Washington County. The early organization of Washington County by the Mexican government began in 1824. At that time, the Mexican Constituent Congress passed an act making Texas a department of the State of Coahuila. In 1831, the Department of Texas was subdivided into the Departments of Bexar and Nacogdoches each with a headquarters and political chief. Due to the increasing population, a third division was made in 1834 with a capital at San Felipe de Austin 35 miles southeast of present-day Brenham. Not long after that the citizens living along the Brazos north of San Felipe petitioned the political chief at San Felipe to approve the creation and organization of the "Municipality of Washington." The petition was approved in 1835. Because the municipality was the most important unit of local government, Washington was granted a host of government positions that provided it stature and influence in the affairs of state. The adoption of the Constitution of the Republic of Texas on March 17, 1836 at Washington-on-the-Brazos forced a reorganization in which the Municipality of Washington became Washington County. In spite of this prominent position in the Republic, only small, crossroads communities, like Washington-on-the-Brazos, Independence, Hickory Grove, Mount Vernon, and Turkey Creek, dotted the County for almost another decade until the heavy immigration of the 1840s led to the establishment of larger and more influential towns.